Copyright �2010 PopEntertainment.com. All rights reserved. Posted: June 1, 2010. It�s not easy to win the lead role in a television series. This is particularly when you have done very little television or film. Add to that not fitting into the box of traditionally Hollywood beautiful and being a little bit quirky. This is one of the reasons that we should cheer for surprise success of actress Brooke Elliott. Elliott was not completely unknown � she had done a lot of musical theater, appearing in such plays as Beauty and the Beast, Taboo and Wicked. However, over a decade into her career, her only real TV and film credits were playing �woman in park� in the popular 2000 romantic comedy What Women Want and a guest role on the short lived Law & Order spin-off Trial by Jury. This makes landing the lead role on Lifetime Television�s hip and happening series Drop Dead Diva even more impressive for Elliott. In a variation of the old Here Comes Mr. Jordan/Heaven Can Wait storyline, Elliott plays Jane Bingham, an aspiring model who is thought to be dead by an over-eager angel and has to come back to Earth in the body of a plus-sized lawyer � an emotional wreck who also happens to be a very smart and talented litigator. The series became a surprise success for the cable outlet, making Elliott one of those overnight successes who had been toiling for over a decade to get there. However, Elliott is the perfect vessel to impart Drop Dead Diva�s message of the shallowness of using beauty to judge a person. Elliott helps prove that even if she doesn�t wear a size 2, a woman can still be beautiful, meaningful and stunningly competent. About a week before the second season debut of Drop Dead Diva and the release of the first season on DVD, Elliott was nice enough to give us a call to talk about her series, her career and her secret girly side. I started singing when I was a kid. There were always little community productions and stuff that I would do. Then I majored in Musical Theater Performance in college and did the high school shows as well. It just kind of went that way. I just began pursuing it professionally. You have done a lot of Broadway work � stuff like Beauty & the Beast, Taboo and Wicked. How is working on television different than the stage? Do you prefer one over the other? You know, they are really different and it�s funny� I love them both and they are so different that it�s hard to even compare. The best way I�ve learned to define the difference between theater and film is the use of your energy. In theater, you start the show and you end the show three hours later, so it�s a big pop of your energy and high adrenaline for three hours. On TV, (chuckles), you have to spread out your focus and your energy for like fourteen hours a day. (laughs) So, that was something that I noticed, you have to really manage your energy and your focus differently. Not having a live audience is also different. Last season, when I first started, you�d go to do something funny and it�s dead silence on the set, because it has to be because they will ruin the take if they laugh. But, coming from the theater, you find yourself going, �Anyone? Was that funny? Is anyone finding that funny?� (laughs again) That took a little bit of getting used to. Previously your best-known role on film or television was a small part in the movie What Women Want or a guest role on Law & Order: Trial By Jury. How surprising was it for you that someone who didn�t have as much experience in filming could land the lead on a major television series? It�s amazing and wonderful and you never know what the universe is going to bring you. I certainly have been taking a lot of TV/Film classes. I�ve been working with a coach, with the intent of pursuing TV and film more than I had been pursuing Broadway. But, to have that happen rather quickly and kind of out of the blue was shocking. (laughs) An exciting shocking. 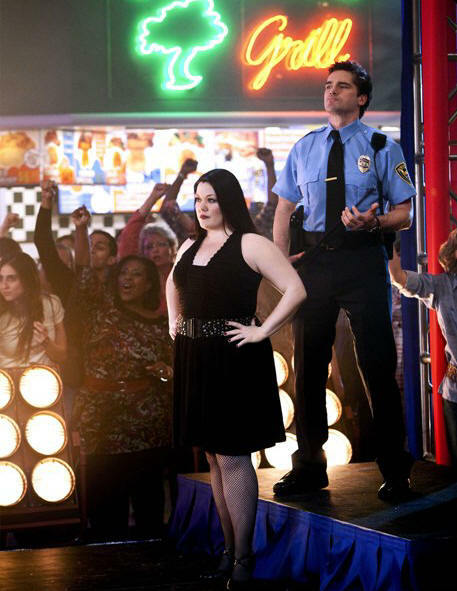 Drop Dead Diva � while a very funny show � also has some very dramatic moments. Do you enjoy that mix and do you find comedy or drama easier or harder to do? One of my favorite things about the show is that we aren�t stuck in a box. We really get to play from the very bottom to the very top and every beat in between. It�s kind of an actor�s dream that I get to play the deep, dramatic, emotional moments just as much as I get to play the comedic moments. It�s really wonderful. It�s a really huge blessing. And, you know, I like both. I�ve been a comedian, and yet they say some of the best dramatic actors are comedians. (laughs) So, I enjoy both. The show is obviously strongly about the shallowness of using attractiveness as a human barometer and whether someone who is not a typical Hollywood beauty can�t be just as or even more competent as someone who is considered beautiful. Working in an image�obsessed business like show business � I mean you are a very pretty woman, but you obviously don�t have the typical model figure � did that affect you as an actress? And how important is it for the show to help get rid of some of these unattainable standards that are out there for women? Yeah, that�s one of the things I also like about the show. I think on some level it is eradicating the myth that beauty only comes in one shape or one size or one look. So many times we fail to notice the beauty that is right in front of our face, because it�s not the beauty that we were conditioned to believe is beautiful. I love that our show, on some level, is saying it�s not true and here is perfect proof. If you had the opportunity come back as anyone, who would you like to come back as? Oh, that�s so funny. Someone else just asked me that question (laughs) and I answered very poorly. Let�s see. I don�t know. Well, I would like to go and be in a man�s body. Any man. Because, to me, I�m always like, �What are you thinking? What are you feeling? You�re such a mystery.� So I�d love to see what men go through every day and the challenges that they have. Obviously I understand it quite well on a female level, but I would love to know what men go through. I am going to interview April in a couple of days. What is she like to work with? Aww, I love April! She�s really great. She�s really funny and every supportive. She�s always there for you 100% and I love that about April. She�s a great person. In the second season premiere, you get to go back to your musical theater roots and do a dance number with Paula Abdul. What was that like? Oh, that was really fun. We had such a good time that day in the mall. (laughs) It was really fun. Every time Paula comes, she brings something great with her. She�s such a great dancer, such a great choreographer � although she didn�t choreograph that particular scene � but I admire her talent in that. It was really fun. I have heard that Cybill Shepherd will also be on the show and Rosie O�Donnell is returning. What are they like to work with and who are some of the other guest stars on tap for the season? Yeah. She is a tremendous actress. If you just watch her, she is so real. She is so committed. She is in every moment. She is a great actor to act with. I always love when she comes to the set. Cybill Shepherd, we�re working with her right now and she is a hoot. She�s so funny and she is so good at what she does. Also a brilliant actor. Both women could not have been more supportive of me and this show. But, every guest star that we have on, whether they are a celebrity name or not, they are so talented and so supportive and so behind the show that it�s been a real treat. What kind of interesting developments can we expect for your character � and the series in general � in season two? Jane, in the second season, she kind of takes a step forward, two steps back. She�s constantly feeling like she�s getting somewhere and then she�s not getting anywhere. Each challenge along the way will give a turn, but she gets to experience a relationship, she gets to experience being single, there�s lots of stuff for her. In the second season premiere, your character is reunited with the lawyer�s short-lived husband who ran out on her and used her. So what is the biggest jerk move that a guy has ever done to you or someone you know? Hmmm� Ooh, let me think. Ooh, I don�t know. I mean, there�s just so many�. (laughs) Gosh, I think any of my friends whose stories I know where they have been cheated on. I think those are the most horrendous. As far as I know, I have not been cheated on by a guy (laughs again), but who knows? Maybe I have been. But I think that crosses a line that is incredibly difficult to get over. Drop Dead Diva is on the Lifetime cable network. Why do you think that some of the most adventurous series on TV are showing up on cable now? I don�t know, but I know what some of the bonuses of it are. Because we are on Lifetime and they believe so much in our show � as does Sony Pictures � we are given an opportunity to build an audience. I don�t necessarily know if on the major network stations that you really get that. If you are not making those particular rating hits every single week, your show is in jeopardy. While we don�t know if we will get a third season or not, we do feel supported enough that we will be given a chance. So, a lot of shows are I think getting that bonus by being on cable stations. Beyond the new season of Drop Dead Diva starting, the first season is coming out on DVD. Did you do anything special for DVD extras? You know, I think we have some behind-the-scenes stuff there. I think there are some interviews and some stuff where we talk about behind the scenes. Actually, I haven�t even seen the DVDs yet, so I am just as curious and excited as everyone else. CLICK HERE TO SEE WHAT CO-STAR APRIL BOWLBY HAD TO SAY TO US ABOUT DROP DEAD DIVA! #1 � 2010. Courtesy of Samuel Goldwyn Films. All rights reserved. #2 � 2010. Courtesy of Samuel Goldwyn Films. All rights reserved. #3 � 2010. Courtesy of Samuel Goldwyn Films. All rights reserved. #4 � 2010. Courtesy of Samuel Goldwyn Films. All rights reserved. #5 � 2010. Courtesy of Samuel Goldwyn Films. All rights reserved.